See ya when we’ve hopefully won some local hearts and palates! 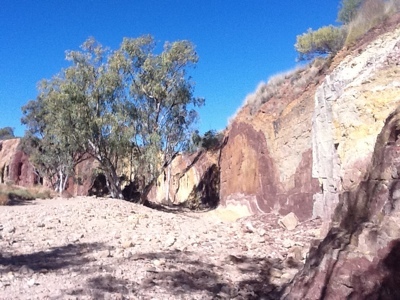 Morning folks, and it’s a chilly Billy frosty desert morning here in Alice Springs, and boy have I got a story for you! Driving up from the Barossa, we got to Spud’s Roadhouse at Pimba, at the turnoff to Woomera. Parked up was a truck loaded with an aeroplane, and seeing as I spend a lot of my life on those things, I’ve developed a healthy interest in them! This one looked like it had done it tough but had an unusual but stylish cockpit and nose wheel arrangement, so I went over for a look. 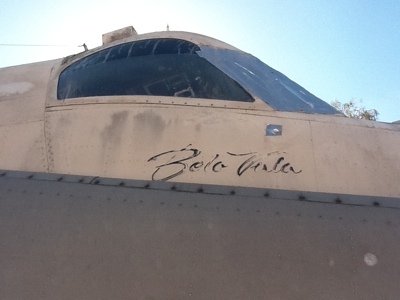 Up close, you can just make out the words ‘Belo Vula’ painted just under the pilot’s – much patched! – window. On the tail plane, there was still an identifying code clearly visible, so I thought that once I had a chance, I’d check it out the Google machine and see if I could find out where the plane had come from, and maybe what it had done. Well! As luck would have it, I didn’t have to wait long, because Tuesday night the truck was parked right outside our motel room in Coober Pedy, and as we were loading the ute up first thing yesterday morning – we met by chance Mouse and his brother Jeffrey – the two blokes responsible for ‘the last flight of the Belo Vula’ – from the old Australian Aviation Museum at Bankstown Airport in New South Wales (near Sydney) to the Central Australian Aviation Museum here in Alice Springs. 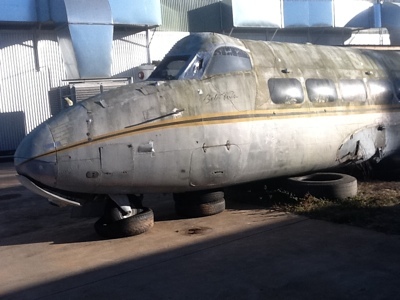 Mouse knew quite a bit about the history of the plane, and what it actually is – it’s a De Havilland DH 114 Heron. So, with what Mouse told me plus a couple of hours on the Internet last night – this is what I’ve been able to piece together. The De Havilland aircraft company developed this four engined passenger aeroplane after the second World War, and in 1950, released the ‘Heron’ into commercial service. Our plane was built in England with the ‘construction number’ or manufacturer’s identification code of 14108. It was shipped to the new post war Federal Republic of Germany to become part of the Luftwaffe (their military air wing) as CA +001. This made her the transport for the first Chancellor of Germany – Konrad Adenauer – as he flew about the world between 1949 and 1963, setting up a democratic government and restoring ties with France and America. Apparently he was quite the consummate politician and colourful character, being quoted as saying “the art of politics consists in knowing precisely when it is necessary to hit an opponent slightly below the belt”. Any rate, what we do know is that the Heron carried 14 very skinny passenger seats, one pilot, no stewardess, and didn’t have a bathroom. But because Konrad Adenauer spent so much time in her criss crossing Eurpoe, he had seats removed so that his armchair could be bolted in! I like the man already! And here is our first interesting mystery moment, because according to Mouse, that armchair somehow made it to the Central Australian Aviation Museum here in Alice Springs, which is housed in the old Connellan Airways hangar, on the site of the original ‘town aerodrome’. And before we go on with the next chapter in the career of our ‘Belo Vulathinness what? Our Konrad Adenauer ends his career as such a statesman that the German government named the air transport that is used for their Head of Government to wing their way about the world on official and diplomatic business……the ‘Konrad Adenauer’. It’s a tradition that stands to this day….and it’s currently an Airbus A340 -313 VIP…..made in France, an obvious illustration of the relationship between France and Germany……mainly rebuilt by our Konrad. So in 1963, Konrad Adenauer finishes his run as German Chancellor, and the ‘Belo Vula’ goes back to the UK and becomes G-ASFI, registered to Shackleton Aviation. But in 1964, she gets sold and becomes CR – GAT for Transportes Aereos de Portuguesa, the national airline for Portugese Guinea, flying around North Western Africa to such exotic locations as Dakar and Bisseau . 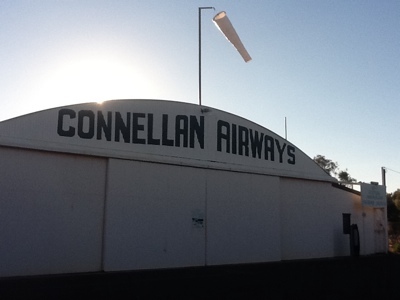 Then in 1970, our bird somehow finds her way into service with Connellan Airways est 1943 in Alice Springs as VH-CLW, just as they change their name to Connair. This regional airline had built up an amazing route structure throughout the Northern Territory and outback areas on the adjoining borders of Western Australia, Queensland and South Australia – which included a lot of station properties and aboriginal communities – pretty much anywhere with an airstrip! So now our bird has flown across post war Europe, the desert of Northern Africa, and most of the desert areas of Australia, and we’re only half way home! It’s also worth keeping in mind that Connair played a big part in evacuating folks from Darwin after Cyclone Tracy devastated the city in 1974, and our ‘Belo Vula’ was probably involved in that as well. In 1976, our plane is sold to Kendell Airlines based in the rural centre of Wagga Wagga in New South Wales – on the passenger runs to Melbourne, Sydney and Canberra. In 1981, she moves up into the Central Pacific island of Kiribati and flies for it’s first national airline Air Tungaru as T3-ATA, based in the capital Tarawa – servicing the Gilbert Islands and Fiji. In 1984 she shifts camp to Fiji and takes on the stunning black and gold livery of Sunflower Airlines and becomes part of their fleet as DQ-FDY, and is named ‘Belo Vula’…….which is Fijian for…..White Heron.At this point in time, she’s flown 18,953 registered hours!! That’s like flying continuously for 789 24 hour days!! This old girl did some serious flying miles for her time, across the oceans, deserts and cities of a huge part of the world. So she finishes with Sunflower Airlines in 1995 – they went on to become Sun Air, then Pacific Sun Airlines – still flying 12 destinations across Fiji. But the ‘Belo Vula’ is sold to an Australian airline, but never flies again. Why? Back to my mate Mouse for that explanation. They added a laminated steel beam to the wings to re in force the strength of the thing, but didn’t put the modification into the maintenance log, so our girl got grounded permanently by the authorities. 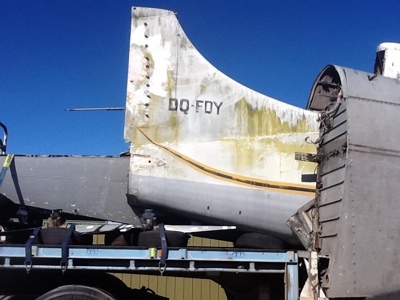 In 1999, the plane is donated to the Australian Aviation Museum in Bankstown NSW, where she fades pretty much away. But wait, that’s not the end of the story. 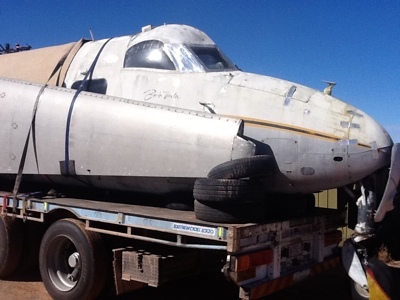 She has been re donated to the Central Australian Aviation Museum here in Alice Springs, so essentially she’s coming home to the same Connellan Airways Hangar that she flew from back in the 1970s. 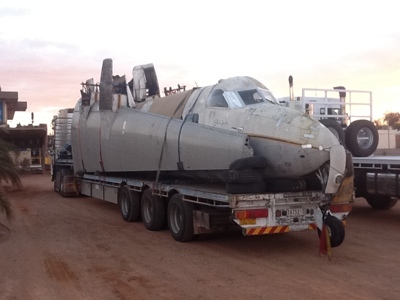 So that’s why the trip on Mouse and Jeffrey’s truck from Bankstown NSW to Alice Springs NT is ‘the last flight of the Belo Vula’. They’re unloading her today over at the museum, so I might even drop by and see how she’s arrived. You never know what you’ll see on the road, and thanks Mouse for the yarn. And yep….she made it home! Morning, folks, just about to repack the ute – thought it best not to leave our wine for Sunday’s tasting outside overnight – and start on the 700 odd kilometers left to Alice Springs. After the first 900 km of the trip, so far I only have one piece of damage to report – a nice solid chunk of glass chipped out of the middle of the windscreen – thanks very much to a piece of road thrown at us by the wheels of a ‘road train’. What’s that – for the folks that haven’t seen one before? It’s a truck (called a prime mover) with up to 3 trailers behind it. And when there are 3 trailers, the last one can ‘swing’ up to 2 metres either side of ‘straight’, and that can make it pretty scary to pass! You need a really long straight believe me. 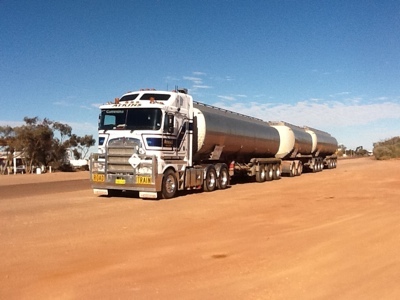 Here’s a road train pulled up at Glendambo yesterday. See ya – have to go pack the ute … and do a Willie Nelson. 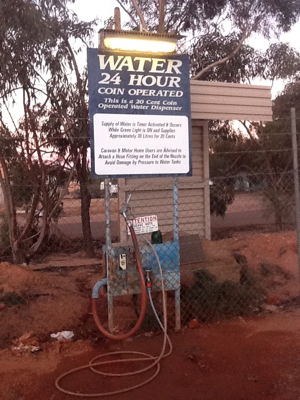 Evening, folks, and we’re camped at Coober Pedy – the opal mining capital of South Australia – overnight, roughly halfway between the Barossa and Alice Springs. 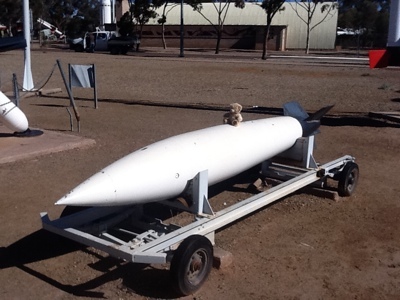 But I just wanted to give you a look at one of our side trips – into Woomera. A ‘Woomera’ is an aboriginal ‘tool’ that was used to notch into the base of a hunting spear, and then by a deft wrist flick and lever action, was used to ‘launch’ the spear at serious speed with serious accuracy. Quite an apt name then for this area – which was set up by the Australian and British governments in 1946 and used to be a hive of military activity throughout the 1950s and 60s as one of the world’s busiest test areas for rockets and missiles. 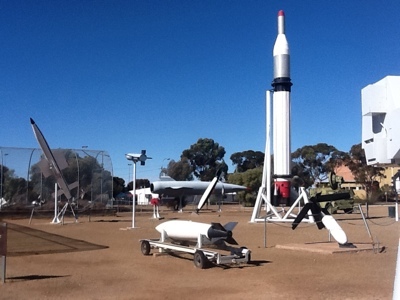 Restrictions on the ‘Woomera Prohibited Area’ were lifted in 1982, and now you can actually go in and visit the historical museum, and the ‘missile park’. Here’s George the Bear on his own ‘rapid transit’. I promised Zach – Mr Food and Beverage at The George Hotel in Christchurch – that I’d make sure that their bear did some interesting things on this trip. Job done! Oh … I should explain. When you stay with The George Hotel, they present you with your own bear, and encourage you to send in photos of where George gets to travel with you … and I did promise. PS if you want to see what this is all about, go to The George Hotel’s home page, and check out the George Bear Blog in the top left hand corner. There, Zach … as promised. 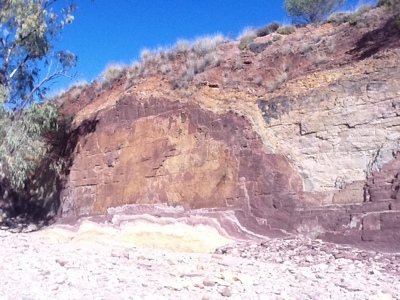 Alice Springs – Here We Come! Hi folks, heading north, north, and further north today with Therese Stoll (our sales gal from Adelaide) on our very own Thelma & Louise (no gun in the glovebox) road trip to Alice Springs. 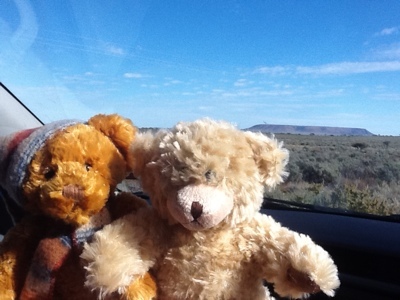 Here are our companions George from The George Hotel in Christchurch NZ and Logan hitchhiking on the dash! We’re going to help our Darwin based colleague out with a tasting at The Overlander’s Steakhouse on Sunday afternoon, and we’ll be catching up with a stack of the Yalumba faithful – like Jan Hayes who has been running events at The Ooraminna Bush Camp for years – using Yalumba wines exclusively. So it should all be a bit of fun. 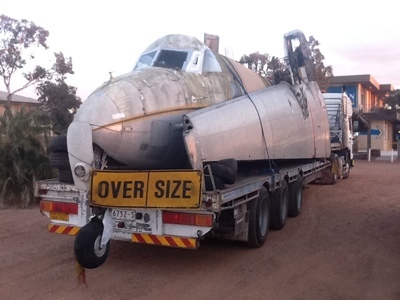 See you when we get to Woomera. 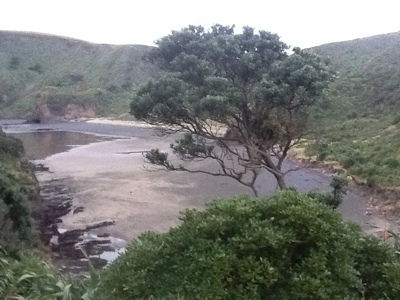 Evening folks, just got in from my excursion to Bethel’s Beach on my day off. Just have to pack the rest of the suitcase, ask for the 5am wake up call – yep that’s 3am Barossa time – as I’m out on Air NZ first thing tomorrow morning. One stop in Adelaide to pick up Big White my trusty Toyota Hilux ute, and we’re off to the Central Market to help chef Simon Bryant with The Big Lunch……supporting the good work done by the folks from The Big Issue magazine. 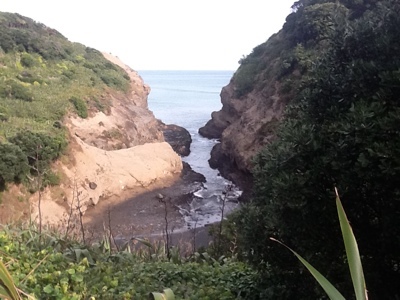 But look where I went today, nothing short of stunning. OK folks, I can’t leave it any longer. I have to get into the London 2012 frame of mind. It’s Olympics time. Right this moment, it’s 7 days 23 hours and 22 minutes until the Opening Ceremony kicks off. So in the spirit of international goodwill and sporting excellence, I’m going to introduce you to the specific athletes that I think show great merit, and we’re going to follow their fortunes on the blog. Firstly, we cannot ignore finely honed water slicing machines – otherwise known as men in Speedos!! Australia has a fine tradition in Olympic swimming, so we are going to follow the 4 x 100m men’s freestyle relay team. Here they are on the back of The Advertiser (Adelaide) newspaper – sorry about the quality of the photo, I was in a bit of a hurry. The four boys are – left to right – Eamon Sullivan, James Roberts, James Magnussen, and Matt Targett. Cameron ‘The Hammer’ Hammond – a young lad from Moree – way way out north west in New South Wales. He’s boxing in the Welterweight division, and has made it all the way to one of the biggest boxing rings in the world…….from the bush. That’s already a massive win in my book! Then there’s the youngest boxer on the squad – 17 year old Jai Opetaia from Watanobbi on the New South Wales Central Coast – competing in the heavyweight division. Make sure you check this kid out, as he’s already been a sparring partner for both Danny Green and Anthony Mundine during their preparations for title fights. When asked to comment about how quick he was for his size, this is what Jai had to say “a lot of people are surprised that I’m that weight and I move the way I do. Every boxer knows……it’s to hit and not get hit!” Definitely one lad to watch. Finally, at 27, there’s the oldest bloke on the team – Luke Jackson from Hobart in Tasmania. This story is all about ‘never say die’. Luke missed out on selection for the 2008 Beijing Games, so he decided that come he’ll or high water, he was going to do everything humanly possible to make the team for London. And he has. Fighting in the lightweight division……and with the added responsibility of being the boxing team captain…….such good luck to you all in London Luke. Now finally, I know there’s a pretty fierce Trans Tasman rivalry between Australia and New Zealand, but the blokes from NZ are very good in sailboats! So I’ve chosen the Men’s Skiff 49er class to follow – the team of Peter Burling and Bkair Tuke. Besides being incredibly talented, if you check out their team profiles, you’ll see two pretty hot black singlet (all NZ sporting teams work on the ‘all black’ colour scheme – it’s been their trademark forever) clad lads……that are incredibly easy on the eye as well. Which makes them such a pleasure to watch out there all windswept, salt spray wet and athletic! There might even be an aftershave ad in there somewhere. We have our Negociants UK gal on the London 2012 ground – Lady Emma Crowther – lined up to send exclusive reports back with respect to Olympic Happenings of Note – so I will ask her to try and track the boys down at some stage for a chat. So there you have it folks. Olympics are Go! Enter your email address to subscribe to Yalumba Stories and we'll send you an email when we post something new.